Is it possible to stay busy with residential sod installation during the winter? When your primary money maker is sod installation and other landscaping work, it can be difficult to make it through the winter. There isn’t much alive to keep you busy, so what can you do when the temperature is below freezing? Residential sod installation is possible in the winter, but you have to be extremely careful about the processes used to ensure you don’t end up with dead materials. Your sod roots will remain dormant until the weather warms up, and then the homeowners will have a jumpstart on their lush and beautiful lawns. What is the ideal temperature to go to work? The problem arises when a contracting company calls on you to do their residential sod installation in the middle of the winter. Just because it gets cold outside doesn’t mean that builders stop putting up houses. If they don’t have someone that’s already purchased the home, or even if they did, they want to finish off all their hard work with a beautiful lawn. It can be hard for them to showcase all the hard work that they have done when the front yard looks like a dirt pile. They expect professional sod installers to come and go to work for them no matter what the temperature is outside. This is where you step in and make magic happen. You just have to know how. Experts in the industry strongly advise against winter planting because the potential for losing your materials is so great. However, that doesn’t mean that it’s an impossible task. After you’ve done it a few times, people will start coming to you for all their winter work. The roots of the sod start out at the surface of the soil that they are being placed on. If the air temperature and the ground temperature are in the freezing numbers, the roots are likely to freeze and die out, and that scares a lot of people away from doing this kind of a project. There are practices that can be followed for residential sod installation that increase your chances for a successful plant. Do NOT add nitrogen right now – the soil isn’t capable of soaking it up when the temperature is so low. It can be added in when the temperature 4 inches below the surface of the sod is 65 degrees, which likely won’t happen to until mid to late spring. Now that the sod has been laid successfully, the homeowner or building contractor may want you to take care of the growing process up through the spring to ensure that it doesn’t die out. There are a few things that you can schedule in to have the best chance of a quality maturing of the sod. The management of the water saturation of the sod is imperative when laying sod in the winter. Rainfall and other cold weather precipitation could be enough to keep the new sod saturated enough, but there may be an additional watering needed every week to keep the first one to two inches of soil wet. You will have to pull up the edges of the sod gently to check the soil underneath and make certain that it’s still moist. Everyone looks forward to those rare winter days when the temperature reaches 60 degrees, the sun is shining, there’s little to no humidity and just a gentle breeze. While it’s amazing for the people who have been suffering through harsher temperatures, one day like this could be enough to kill off your sod. The turf can quickly dry out in these conditions, and all the hard work that has been done up to that point can be completely unraveled through desiccation. Another problem that you could have to deal with is cold weather injury. When dormant grass is subject to extremely low temperatures, it can die without it being noticeable until the weather warms up in the spring. Most often, stolons, crowns and shallow rhizomes in the turf are killed off with the colder temperatures. It’s probably something that you’ve stumbled across before when a lawn ends up dead the spring after it was planted. It’s also important to note that you shouldn’t be using herbicides on the dormant sod either before or after it has been planted. When you do, you run a chance of causing permanent damage that you won’t notice until after it’s already too late. It’s best to just pull out the visible weeds by hand and worry about the rest later. If necessary, any herbicide or other chemical agent can be applied in the spring when the temperatures go up. You have to be 100 percent confident that the sod you are planting is, in fact, dormant and not dead. There are several different types that are better for cold weather planting, including Bermuda grass and fescue. St. Augustine is another kind of sod that has been used with success, and it will stay green even throughout the winter season. Centipede and zoysia are other options when exploring the options for sod installation. The tug test – grab a decent section of the exposed grass and pull on it. If it easily comes out from the rest of the turf, there’s a good chance it’s dead. It’s not going to come back either regardless of how much you try and nurture it, so you have to look for something else. 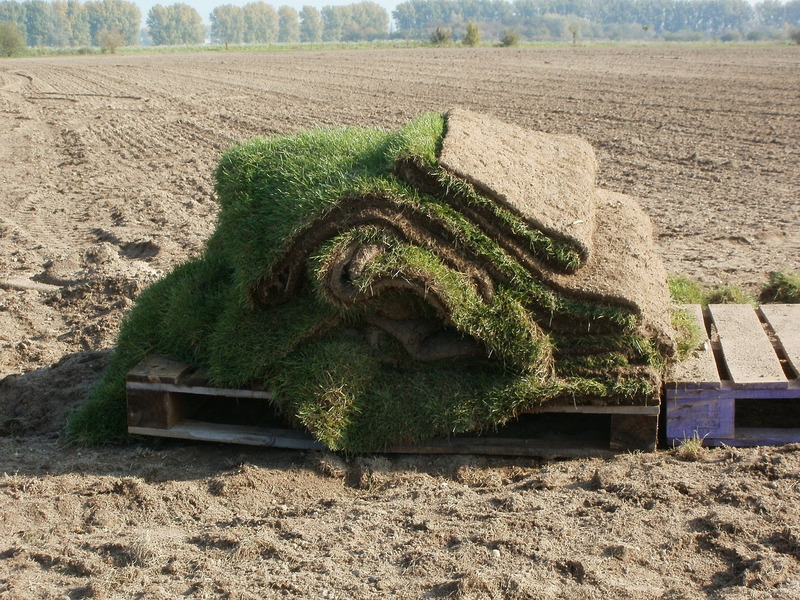 Patterns – roll out a section of the sod. If the brown is even throughout the entire section you are examining, there’s a higher probability that it’s only dormant. If there are random patches of brown that don’t fit into any sort of pattern, it’s probably dead. If the sod doesn’t pass both of these tests, you don’t want to install it. You could be dealing with a much bigger problem and expense in the spring when the homeowner or contractor realizes what you installed isn’t growing and it all has to be replaced. The rest of the processes for sod installation are going to be the same as what you’re used to doing, making the job a familiar one. You might be wondering, though, why not just wait until the spring when there is a less of a risk for failure? There are several reasons, really. You are going to have a head start on the grass growing sooner when it’s already established prior to the growing season. There isn’t as much watering necessary when you do residential sod installation in the winter, either. Working in the winter, you also don’t have to deal with the mud, water and mess that comes along with the spring thaw, making the job a lot cleaner. As long as you can handle being outside in the freezing temperatures for the time it takes to get the project completed, there should be no reason that you can’t successfully stay busy and complete several sod installation jobs this winter. EDITOR’S NOTE: This article was written by Rich Bruno, owner of Boston Landscaping Services, based in Boston, Massachusetts.